More than 580,000 homes across the UK in remote locations will now be able to get speedy internet connections. EE has launched a new home broadband offering to connect up thousands of rural homes across the UK to superfast internet. The company is upgrading its 4GEE Home Router to boost internet speeds in remote locations, with as 580,000 rural homes across the UK could be connected up to its superfast 4G network, letting customers experience speeds of over 100MBps for the first time. 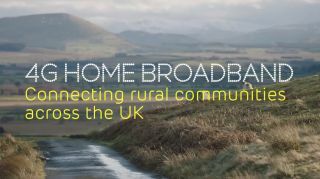 EE says that the new offering has been designed specifically as an alternative for those in rural communities that have yet to be connected with traditional fixed line broadband access – or where customers can only receive slower fixed broadband speeds. The company's 4G network which currently covers 90 per cent of the UK, with the company aiming to boost this to 95 per cent soon. “As our network continues to expand into some of the most remote parts of the UK, we’ve seen the amazing impact that 4G connectivity can have on rural communities," said Max Taylor, EE managing director of marketing. The new service will be available from today to EE customers, with introductory packages starting from £35 to £60, with a 4GEE Home Router included. Any current EE pay monthly customers signing up to the new offering will get an extra 5GB of mobile data per month.